The Carina Dress stuns again in a feminine rosey shade. Cut in a deep sweetheart neckline, your shoulders are kept bare by off-shoulder short sleeves. An extremely flattering bodycon fit, the skirt falls out into an elegant train. 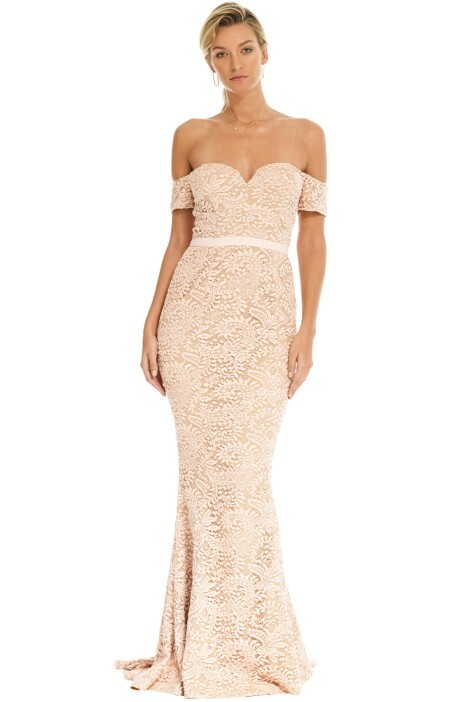 Finished off with a rich lace overlay of a paisley-inspired print, it's perfect to rent for you bridesmaid procession or formal night. Pop a shine of highlight on your cheeks, hire a classic clutch and pare back styling for an angelic look. Complete with a romantic tassel drop earring in a rose gold for a coloured harmony. Read our blog for more bridesmaid trends this season. LENGTH: This dress is floor length and measures 140cm from underarm to hem. Please note this gown has a sweeping train.